Here is the DIY tip that prompted so many of my friends to encourage me to start a blog. When I posted this picture of my homemade deodorant on Facebook back in April, almost as many friends “liked” it as they do when I post photos of my kids. If you have your own kids and have experienced the flood of “likes” you get when you post a cute picture of them, then you have an idea of how popular this post was! Since I received a lot of follow-up questions via private messaging when I posted the picture and accompanying recipe, I thought it might be beneficial to dedicate a full post to the process of making your own deodorant at home. For several years, I had searched for a natural, aluminum-free deodorant that worked, without any luck. Reluctantly, I purchased a small jar of Primal Pit Paste despite the $8.95 price tag because I’d read rave reviews about it on The Healthy Home Economist, a blog I follow. Sure enough, it worked amazingly well. Not wanting to have to spend so much money on deodorant, I thought I’d try to replicate the pit paste at home. 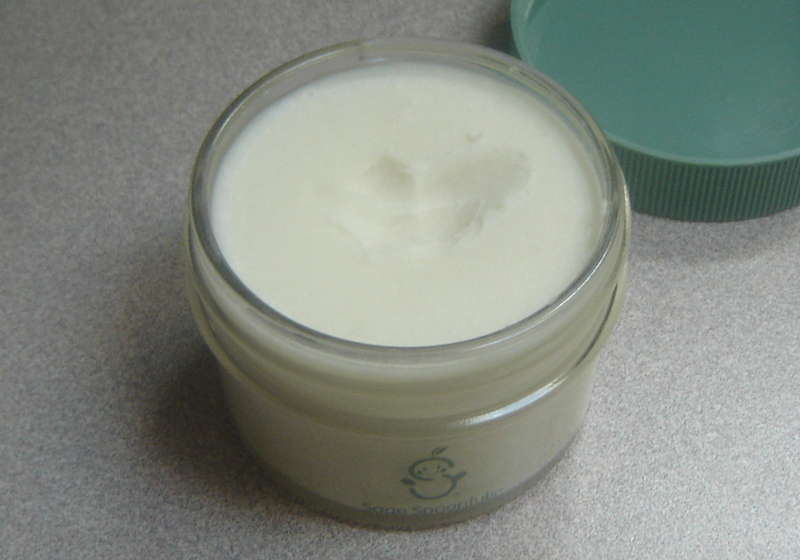 The ingredients listed on the label were simple: shea butter, arrowroot powder, coconut oil, and baking soda. The exact amounts weren’t listed (no for-profit company is going to give away it’s secret recipe!) but the descending order meant that shea butter was the greatest ingredient by volume and baking soda the least. So I purchased all four ingredients at my local food coop/health food store and experimented in my kitchen until I came up with a recipe that worked (below). To make it, simply melt the shea butter and coconut oil over low heat in a stainless steel saucepan then stir in the remaining ingredients. Pour the mixture into a small glass container (I purchased mine from Target), refrigerate for an hour or so to re-solidify, then move to your bathroom for regular use! I added a drop of tea-tree oil to my recipe after coming across Mommypotamus’s recipe for homemade deodorant. If you don’t have air-conditioning, I strongly recommend against relying solely on coconut oil as your base like she does in her recipe because it turns liquid at 75 degrees Fahrenheit (the shea butter will stay solid); but I definitely like her idea of adding a drop or two of essential oil to each batch. Once I figured out a recipe that works, it now takes me less than 10 minutes to prepare a batch every four to five months (yes, that little 4-ounce jar lasts that long!). You only need a pea-sized amount under each armpit; apply it with your fingers and rub it into your skin (I scoop it out with the back of my fingernail). Based on the prices I paid for my ingredients, the cost works out to about $2.50 per 4-ounce jar, and I will be able to make several jars before I need to purchase more ingredients. Mommypotamus claims that this type of deodorant also works for her husband, so you may be able to cover your entire family’s needs in just 10 minutes every few months! I’m thinking rosemary or bergamot essential oils would make good “man” smelling deodorant. One caveat is that you may need to adjust the recipe slightly to suit your own skin (or your partner’s), using more or less baking soda (the deodorizer) or arrowroot starch (the moisture absorber). The nice thing about this deodorant is that if it doesn’t quite work for you, you can simply scrape it back into a saucepan, melt, and add a little bit more of this or that until you have a formula that works. Just make sure to write down what you did so that you remember it for next time! I will admit that even this deodorant doesn’t work on the first two days of my period. For whatever reason (hormones? ), I just stink those two days of the month no matter what I try. But for regular, everyday use (even during hot summer months without any air conditioning), this deodorant works, and works well.